COLORADO AIRPORT OPERATORS ASSOCIATION | Serving the common interests of the owners, operators and users of the 79 public use airports located throughout Colorado. 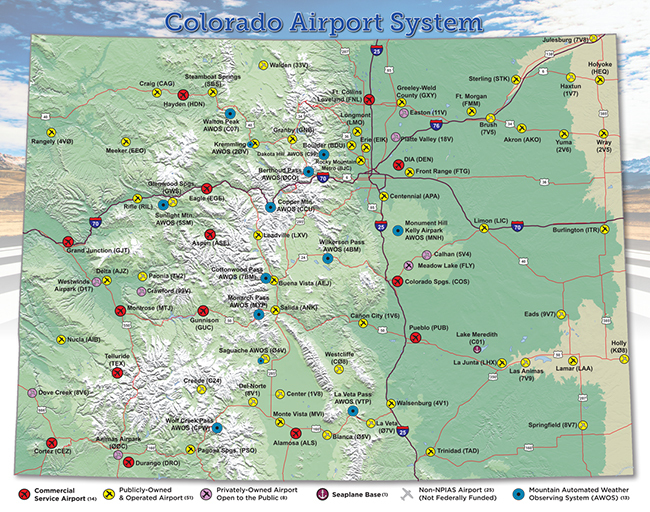 The Colorado Airport Operators Association (CAOA) serves the common interests of the owners, operators and users of the 74 public use airports located throughout the State of Colorado. CAOA provides a unified voice for airport operators to State and Federal agencies, the General Assembly and the Congress of the United States of America, on proposed or pending legislation and regulations. It further provides a medium for the exchange of ideas, methods, information and experiences relative to airport operations, promotes and encourages the public’s understanding of the value of aviation and airports throughout Colorado communities, cooperates with local governments agencies and their organizations for the betterment of aviation, and promotes safety in the development of airport facilities and operating procedures. This site was designed to provide useful resources for use by CAOA members in the operation of their airports, and to provide information to the general public about the CAOA organization, and the benefits of membership.